One truism about computer hardware is that, once purchased, it immediately starts falling behind the leading edge of the technology curve. Consider the Dual-2.0GHz Power Mac G5 I purchased in September 2003. At the time, it was a powerhouse. And it’s still a powerhouse. But machines that have been built since then have seemingly all spent time at the gym; even today’s Mac mini can better my Dual G5 in a number of performance categories. One area that’s seen a lot of progress since 2003 is hardware for CD and DVD ripping and burning. When I bought my G5, it came with a state-of-the-art SuperDrive. Fast forward four years, though, and suddenly that state-of-the-art drive is looking quite antiquated. Sure, drive speeds have increased substantially, but for me, the real problem was dual-layer DVDs. I set out to replace the built-in drive with something faster that could both read and write dual-layer DVDs. Dual-layer DVDs give you 8.5GB of storage space per disc, and at a rough cost (today) of $0.15 per gigabyte, they’re somewhat cheaper than hard drive space. They’re also quite portable, making them ideal for backing up key files to off-site locations. In my case, I wanted to upgrade the G5’s drive not just for backups, but because some software I was beta testing required dual-layer DVD discs. Remove face plate and door cover from new drive. Transfer face place, metal shielding, and mounting screws from old drive to new drive. Install new drive and power up. In general, I’m thrilled with the upgrade, though it was not without its quirks. Like most projects I undertake, I did only minimal research before diving in—nothing like leaping first and looking later. I did, however, at least run System Profiler on the G5 to get the specs on my current drive. Clicking on the ATA entry in the Hardware section of System Profiler showed me that the drive was a Sony DW-U10A. After a bit of work with Google, I determined that the stock drive could read DVD-ROMs at 8x and CD-ROMs at 32x, burn DVD+Rs and DVD-Rs at 2x and 2.4x, respectively, and burn CD-Rs and CD-RWs at 24x and 10x, respectively. By today’s standards, that’s quite slow. For a replacement, I considered installing the same drive I added to my Mac Pro, a Sony AW-Q170A. However, I bought that drive last November. I figured there must be faster drives out there by now. The only thing I knew I wanted to do was to keep with Sony drives—probably more out of superstition than anything else. Since the machine was working with a Sony drive, I figured a newer Sony drive should also work. That one restriction led me to the Sony DRU-840A, which is a really fast drive with full dual layer support. I bought mine locally, paying about $10 more than I would have online, but getting it a day earlier. Based on the published specs, at least, the new drive was going to be substantially faster than the older drive—assuming it worked. 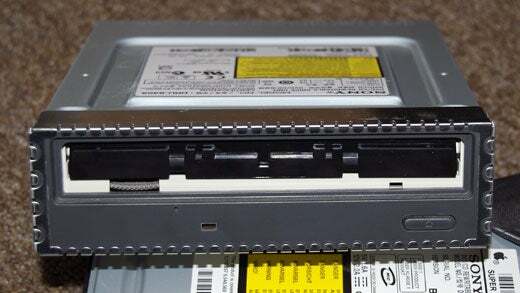 Stock optical drive is a Sony DW-U10A. New optical drive is a Sony DRU-840A. But the big question was…would it work? 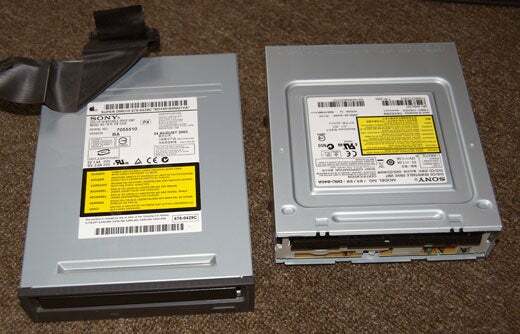 When I picked up the drive, the first thing I noticed is that although it’s described as an internal drive, its front bezel, as seen in the image at right, is really designed for a PC case, where it will be basically outside the case. The G5 (and Mac Pro) have only a slender slot through which the CD tray can extend, and I wasn’t sure how much room was available behind the case for the bump on the front of the drive. However, this drive features both black and white face plates, so I knew the bezel would be removable. When I got the drive out of the box, the first thing I did was remove the bezel. Removal was easy; I just followed the directions in the box, and used the included tool (or a small flathead screwdriver) to pop the latches that hold the bezel in place. Thankfully, the people who design these things are smart, and the holes for the mounting screws are offset from the front of the drive, not the back—so they lined up perfectly betewen the two drives. I moved the mounting screws to the new unit and gave it a quick test fit to be sure (no issues). At this point, it was time to put the drive into the machine and see what happened. I transferred the cables from the old drive, including the sticky tape that helps hold the connector cable in a 90-degree bend on the top of the drive. When I went to install the drive, this was actually the cause of the only (minor) issue I had: because the drive is shorter, the 90-degree bend put the cable at the wrong spot to fit through the hole in the mounting bay (which you need to route it through to connect it to the motherboard). After a bit of prying, though, I got the cable in place and connected. I then buttoned the machine back up, hit the power switch, and then waited to see if the surgery was successful. After power up, I ran System Profiler to see what it saw for my new drive. In the Disc Burning entry of the Hardware section, next to Burn Support it said Yes (Unsupported) . Looking down at the entry for DVD-Write, all the formats were listed with one exception: there wasn’t an entry for dual-layer DVD-R, just dual-layer DVD+R. So all the expected formats were supported, plus a few I’ve never heard of. But how well would it work? To test the drive, I set about reading from and writing to a variety of media I had lying around the office. The results were mixed, and I’m not sure exactly why. Perhaps the drive isn’t fully supported, and OS X doesn’t know about its top speeds. Perhaps there’s some limit in OS X relative to drive speed in general, and Leopard will address it. However, despite the mixed results, every single result is notably faster than it would have been with my old drive. Most importantly, dual-layer burning and reading worked perfectly, which was my main reason for upgrading. For my reading speed tests, I picked a few discs out of my collection, pretty much at random. I then timed how long it took to copy the contents of the CD or DVD to the desktop, starting the stopwatch when the Finder’s progress dialog appeared. The results were interesting: the structure of the files and folders on a disc has much more to do with the speed of copying than does the amount of data, as you can see in the results below. Tests were run on a Dual 2.0GHz G5 running 10.4.10 and a Sony DRU-840U. The stopwatch was started when the Finder’s progress dialog appeared, and stopped when the dialog disappeared. x Speeds are rounded due to the variability in hand timing. The size and file count figures were as calculated by Xray . My speeds varied from a low of 10x to a high of 28x, against a theoretical maximum of 48x. The slower speeds came from CDs with lots of files and folders, even though they were of a similar size as the faster CDs. I also ripped one CD (Eagles - Hell Freezes Over, at 128Kbps AAC), and it took 2:13, for an effective speed of about 39x. The Finder apparently adds quite a bit of overhead, for simply copying that same CD to the Desktop required 2:31 (34x), which is more time than it took to read and convert the files in iTunes. Very strange. On the DVD reading side, I used two software packages, a theatrical film (Raising Arizona), and a disc of iPhotos burned to a dual-layer DVD+R disc. The results here were more consistent, varying between 8x and 10x for the DVDs—except for the movie, which came in at 4x. The drive’s theoretical maximum for DVD reading is 16x. I’m not sure why the movie disc took so much longer, but it was true even on a repeat of the test. For the final round of tests, I burned a variety of data using iTunes or the Finder, depending on what media I was testing. As you can see in the results, while I could get close to the theoretical speed of the media, I never approached the drive’s maximum speed as shown in the earlier table. Part of the problem is in finding media rated to match the drive’s maximum speeds. I couldn’t, for instance, find any 20x-rated DVD media to test with. However, it’s also obvious that OS X isn’t pushing the drive as fast as it could possibly go. I’m not sure if that’s due to a lack of support for the specific drive in OS X, and an overall speed limit within OS X’s burning frameworks. Perhaps things will change with Leopard. Overall, I’m quite happy with the drive upgrade. While I’m not getting all the speed the drive is capable of, I am getting much faster speeds than with the stock drive. More importantly, though, I now can write to those relatively cheap and ever-so-useful dual-layer discs, and I’ve not had any read or write errors since installing the drive. This hardware upgrade was really simple, and in my case, it didn’t void the warranty, for that’s long since expired. As with anything that involves modifying your hardware, however, be aware that something could always go wrong. Back up your data first, remember to ground yourself before opening the case, and take your time. If you have questions about any of the steps, please let me know.